Established in 2007 by Donegal native Conal Thomas, Conal’s Tree Services has grown from strength to strength to become the premier tree surgery and tree maintenance company in Ireland. 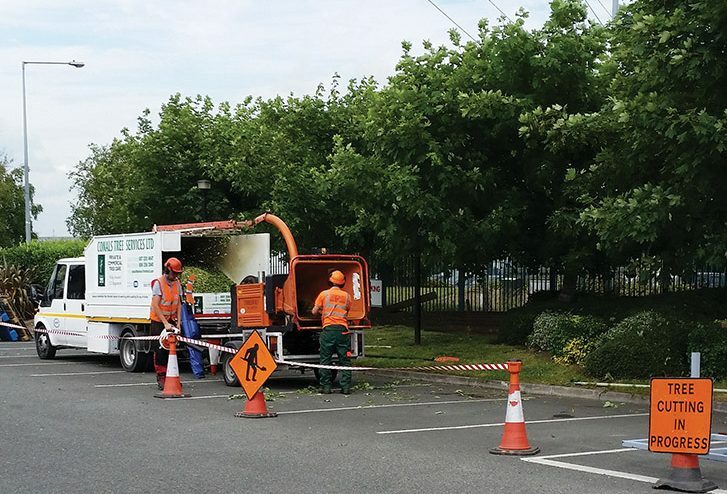 Conal’s Tree Services have doubled their employees every year since its foundation in 2007 and continues to win prestigious contracts annually from Ireland’s leading infrastructure companies including ESB networks. Conal’s attention to detail and devotion to the safety of his staff and those for whom they are working is evident in being awarded the highest available safety accreditations from SAFETCERT (The Safety Management Accreditation System for the Construction Industry) year after year. Conal amassed a vast experience in the tree care field as Irish representative for Asplundh Tree Services for over seven years. A natural progression from this position was to branch out on his own which he did in 2007 and has not looked back. With six employees, the company started out in his adopted home in Mallow, Co. Cork, before expanding its headquarters towards the capital in Kiltiernan, Co Dublin. Today, there are 44 employees on the payroll, including Conal’s wife Majella, son Stephen and daughters Julie and Shelley. With over 30 plant vehicles from hoists to tippers, trucks to stump grinders, Conals Tree Services has equipment at their disposal to handle all types of tree care projects. Their services, which include tree surveys and inspections, tree pruning and removal and aerial and ground trimming, were very much in demand during the recent freak weather conditions that afflicted the country. It was all hands on deck as they helped clear up the mess left in the wake of Storm Ophelia and, more recently, ‘the Beast from the East’. Offering a 24 hour emergency service, Conal’s Tree Services have the know-how, training and equipment to tackle any size of tree care work. They carry out work for many customers, from the country’s largest utilities to private customers. Their dedication to training and safety ensures that all work is carried out proficiently, efficiently and with minimal disturbance for all. With this work ethic in mind, Conal’s Tree Services places huge importance on the necessity for training and safety is everything that they do. Conal’s Tree Services continually strive to improve they offering, maintain their 100% safety record and to set goals for themselves in a bid to being the best they can be within their industry. Future goals are to achieve the ISO 9001-14001 accreditation and also to attain Approved Contractor status from the Arborists Association. In addition, Conal and his dedicated team recognise that their activities have environmental impacts and that it is their responsibility to manage these impacts through responsible environmental management. Protecting the shared environment is of fundamental importance to Conals Tree Services ltd, as it is to their employees, customers and other stakeholders. Another string to Conal’s Tree Services’ bow is their training school which operates out of their headquarters in Kiltiernan. The school runs all year round and over the years has trained many students in all aspects of tree care with a 100% record in bringing these students through to employment. Students are trained in all aspects of tree care from safe use of chainsaws, to first aid, manual handling and the correct techniques of climbing aloft. Anyone that enrols in the school can rest assured that they will be learning from the best. The company provides high quality services at very competitive prices. They will consider any job, large or small, and you can be assured that it will always be completed to the highest possible standards by their helpful and experienced staff.